Three Summers | Movies | Palace Cinemas | Share our passion. Cast: Magda Szubanzki, Michael Caton, Kelton Pell, Deborah Mailman, John Waters. 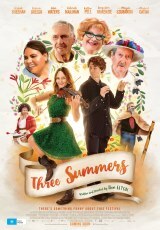 From internationally renowned writer-director Ben Elton comes Three Summers, an ensemble comedy that embraces the diversity of modern Australia. At a summer music festival, the feisty lead singer of an Irish folk band (Rebecca Breeds) meets a folk music-hating Theremin player (Robert Sheehan) and sparks literally fly. Characters surrounding this awkward romance include a fiercely Aussie Morris Dancer (Michael Caton), an Indigenous dance troupe, a group of wine-loving empty nesters, a power-tripping security guard, a wannabe girl rock band and some musical asylum seekers. In fact, all manner of stories collide under the meddling eye of community radio superstar, Queenie (Magda Szubanski), who welcomes the campers back three summers in a row for a folking good time.